A few days ago I described the problems we were encountering in our new home. I said that we would handle them and that seems to be the case. We are working long hours and are bone-weary at night, but the exercise seems to be good for us and we certainly have no trouble sleeping. Yesterday, many of the problems were efficiently handled by our builder, Southern Heritage Homes of Rocky Mount, VA. They are proving to be quite responsive in dealing with these post-installation equipment failures. They sent out a plumber named Dan who was a pleasure to work with. He replaced the dishwasher, fixed the kitchen exhaust fan, reset the toilets so they don’t rock, and fixed some crossed wires in the Master bathroom. When he left, Gretchen was the happy owner of a kitchen that worked the way she wanted it to. Our well water still smells of chlorine and metal, but I purchased a test kit from Lowes and it showed nothing out of the ordinary for this location. Our results showed our well water to be slightly hard with a ph of 6.5. Chlorine was less than 0.5 ppm, hardness was 50 ppm, alkalinity less than 80 ppm, nitrate/nitrite 0 ppm, iron approx 0.3 ppm, copper less than 1.3 ppm, and total dissolved solids 38 ppm. To give us the drinking water quality we want, I have ordered the same 6 stage Reverse Osmosis system we used in our previous home at Lake Monticello. It should arrive in a few days and I will describe the installation. The water produced by this equipment has to be experienced to be believed. Until I used this system, I never realized that pure water tastes sweet. When all of the goop and chemicals are removed from drinking water, it tastes wet, and the absence of stuff in the water makes it taste exactly like the glacier water we were able to buy a few years ago. Wet and sweet, an unbelievable experience! The house is now surrounded by new holes containing concrete footings. These footings will support front and side porches and a deck in the very near future. We will soon be able to enjoy outdoor views from a vantage point high above our muddy surroundings. The Smart Vaults in our front yard will soon be history. We emptied the last of them a few days ago and they will be picked up today. They provided us with flexible storage of our furnishings at both ends of the move. I would recommend anyone contemplating moving should look into Smart Move, especially if you are hoping to do the packing yourself or if you need storage during the move. This entry was posted in Moving to Floyd, Possibly Helpful Advice. Bookmark the permalink. What brand/model is the Reverse Osmosis system? Thanks for your comments. 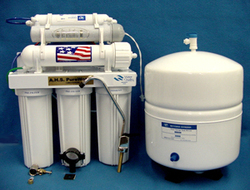 I have provided more information about the Reverse Osmosis system in the next post.